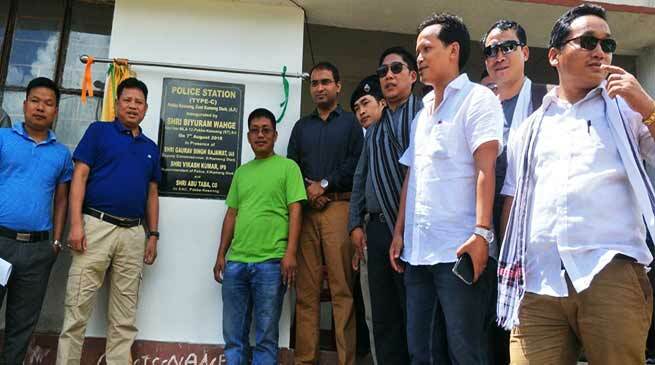 After years of waiting, at last the police outpost of Pakke Kesang is ready, and was inaugurated by Local MLA Biyuram Wahge on Tuesday in presence of Garuav Singh Rajawat, Deputy Commissioner East Kameng district, Vikash Kumar, SP, East Kameng and EAC of Pakke Kesang . The credit goes to MLA Biyuram, said the local people. However talking to Arunachal24, Biyuram said that he is only the people’s representative and that it is his duty to work for the welfare of the people. The main credit goes to our Chief Minister Pema Khandu, Chief secretary Satya Gopal, Home Minister Kuamr Wai, DIG and DC of East Kameng district and officials, he added. He also said that The outpost was completed only due their support and cooperation of the local people. Biyuram also distributed LPG cylinders and stoves under Pradhan mantri Ujjawal Yojna to 150 beneficiaries in Pakke kesang. Pradhan Mantri Ujjwala Yojana (PMUY) aims to safeguard the health of women & children by providing them with a clean cooking fuel – LPG, so that they don’t have to compromise their health in smoky kitchens or wander in unsafe areas to collect firewood.